Title : Tanka Tanka Skunk! Tanka Tanka Skunk by Steve Webb is one of my personal favourites. Tanka is the elephant and his friend Skunka a skunk. The book doesn’t follow a story or plot of some sort, but is more about words, musicality and rhythm. The illustrations are vibrant, colourful and eye catching. Also, the background stripes are cleverly designed to help keep the beat as one reads. The book also teaches children the names of different animals such as: panda, panther, tiger, zebra, alligator, fox, tiny little hairy spider, armadillo and ox. This book is great for teaching children music, rhyme and rhythm. It makes rhyming fun for all ages and encourages children to read aloud. The book also teaches children how to read at different paces and the rhythm of syllables. Clapping the syllables is a great activity that can be used in KS1 as a literacy starter or plenary.I had the privilege of reading Tanka Tanka Skunk with a year 2 class. They thoroughly enjoyed reading this book and making their own percussion instruments in a music lesson. 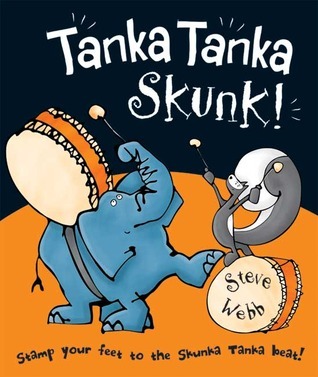 Tanka Tanka skunk written by Steve Webb was a book I was introduced to when I was working in a primary school and I used it in my phonics lessons when teaching them syllables. It is filled with pictures of different animals and insects such as polar bear, tiger and caterpillar, and it captivates the reader with all the different colours and also helps them learn the different animals at the same time. The book starts off with “stamp your feet to the skunka tanka beat”, in which you have to stamp your feet to each syllables of the animals, for example cat-er-pil-ler, pan-da. Although you can either clap your hands or use musical instruments to make the activity different. Overall I think this book can be used from the age of 4 – 11 as children at the young age of 4 can start to learn the different animals and for the other years the book can be used in lessons when teaching children about syllables, rhythm and beats. I saw this and just had to write a review for it. It's been years since I first read this and to this day, I can still quote loads of it (I know, perhaps now the best endorsement when it has so few words in its!) However, my kids loved it, and I loved it. So please, give it a chance and then, in ten years time, you'll still be quoting pages of it!! My favourite line is 'ant eater, ant eater, BIG BLUE WHALE' said in a very LOUD VOICE! This is all about words as rhythm and is great fun to read out loud. Keep in mind for learning syllables, reading with rhythm sticks or drums, and using with a music & movement program. If you know anyone who plays the tabla or "talking drum," that would be an amazing tie-in. Explores beat, pulse and rhythm. Looks at chronological order. A fun read-aloud chock full of onomatopoeia and rhythm. A rhythmic animal celebration. Add a group of preschoolers, wooden sticks to beat the ground with, and an enthusiastic librarian to read the books, and you have a party. A library storytime read. I'm a big fan of using shakers to accompany at least one book or song during my storytimes and this book is perfect for just that purpose. The cover says "Stamp your feet to the Skunka Tanka beat!" This book takes advantage of the rhythms and syllables of different words and turns them into a fun interactivity. The cover encourages you to stamp along, but you can grab shakers or rattles and shake along, or you can get all creative and make your own noise maker and play along with the prose: "Cat-er-pil-lar (slow shake with each syllable) BIG (one strong shake) gorilla (three regular shakes) yakety yakety (three fast shakes with each syllable) yak (one regular shake)." I haven't yet tried it, but I think it would be great to read and stamp/shake in example then repeat the same phrase so your audience can imitate and stamp/shake along with you. I think its perfect for preschoolers and possibly toddlers, too. If you are teaching school aged children about syllables this would be perfect. Tanka Tanka Skunk! by author and illustrator Steve Webb makes superb use of musicality to accompany vivid and amazing illustrations. Tanka (an elephant) and Skunka (a skunk) play drums. Webb repeats the rhythmic tune that the two characters play throughout the book: “Skunka Tanka/ Skunka Tanka/ Tanka Tanka Skunk.” Then he moves on to other beats using an assortment of different animals. He shows how kangaroo has three beats and caterpillar has four: “Kang – ga – roo” and “Cat – er – pil – lar.” The lively illustrations go right along with the name of every animal. Then the book sets off to make a musical reading experience out of all types of animal names. This is one example: “Panda/ Panther/ Tiger/ Zebra/ Alligator/ Fox// Tiny little hairy spider/ Armadillo/ Ox.” The great illustrations perfectly accompany each animal name. This is a fun and fantastic read-aloud picture book. CIP: noneSummary: A picture book full of rhythm and animals in clever combinations.Review: This is a fabulous book! It very cleverly combines animal names and delightful pictures in a rhythmic beat that will have toddlers and preschoolers chanting along with a smile on their face. Perfect for people who want to put music type materials into their storytime without actual singing. Also, challenges the reader to repeat the book, but *faster*! !SLJ says: "Storytime audiences will revel in the beat"PW says: "The infectious cadences and comic animal portraits make beautiful music together to the very last page"
An innovative and visually stunning picture book uses animal names to introduce rhythmic language and rhyme, as Tanka the elephant and his friend Skunk play drums to keep the beat. Steve Webb's innovative and visually stunning picture book introduces young readers to simple rhythms with this riot of shout-out-loud words and cavorting animals. A great way to teach children about syllables while clapping along. At first I was a bit perplexed by this book. My son read it to me, and he giggled at it, but nothing made much sense. But when I took a second look at it, I got it. It's a great rhythmic read aloud, and if you liked Hand, Hand, Fingers, Thumb, you should like this one equally. Full of onomatopoeia, it's actually quite the clever book. This is lots of fun to read aloud, especially if you or your audience helps with the beat. But it's AMAZING when read aloud with the accompaniment of a symphony percussionist. January 2016 - a hit.August 2016 - Ben is on his way to memorizing this one!April 2017 - still fantastic.February 2018 - a friend mentioned her 2-year-old loving this (and even reciting it in his sleep), which made Ben want to read it again. Still a hit. This rhyming book uses animal names to create rhythm patterns that are silly and repetitive. Great fun for a regular story time, body percussion activity, or drum circles. Recommended to me by a Mom who uses it at home with her 3 children (5, 3, 1) and they read it almost every day! Plus, she has a gathering drum at home they include for the ultimate home experience. Tanka Tanka Skunk!by Steve WebbSpent the week reading this to kindergarten, first grade and second grade, in music class. Its a book that shows rhythm, and syllables. Similar in nature to a Dr Seuss book because of the rhyme schema but but it does show rhythm. You can chant the entire book, using rhythm patterns of the words to teach rhythm. the kids had fun following the words. The rhythm and fun, tongue twister-like words make this a great read-aloud. It would be fun to have the kids pat along to the “chorus,” or have drums to beat every time the "Tanka Tanka Skunk" part comes up, but I'm not sure the younger set would quite get it… This one would probably be better for an older group. i used this one for memory care story hour. Even if the drawings a cartoonish, it worked with the fun of the book. Not only did the circleaudience enjoy a satisfyingly memorable phrase to repeat, they got some good out of the rhythm instruments I brought to accompany it. I'd highly recommend trying this one for some laughs with a wild animal theme. Wordplay. This one is so much fun! This is great for the "sing" practice, because it has such a strong rhythm. Children can clap or stamp along with the syllables, and the storyteller can really emphasize each syllable of the animal names, to help children hear the language better than they might in normal conversation. Recommended to me by two children's librarians, Tanka Tanka Skunk is one of the most fun toddler books I've read. The page backgrounds have different solid colors, the black font is fun, and the cartoon-like pictures are adorable. The text doesn't tell a story, but plays with the fun of words, including rhymes and beats. Great for a toddler or pre-school storytime. This is a great book. Nice simple pictures, easy and fun to read. It takes several times through to get the rythm of it all down. I think my baby will like it even more when she's older. It's a lot of fun now, but I think she'll just love it in a year or two. What a hit this was in storytime...not just with the kids but also with the adults. Animal names become rhymes with a repeating visit from Tanka (elephant) and Skunk. Fun to read, fun to build audience participation. There's no story here, just a kind of rhythmic chant using animal names. It's pretty fun. Should you choose to read this to young ones, though, I warn you that it could go on forever because the last page says to read it again only faster. This one didn't grab me like I hoped it would but still a solid book Tanka the elephant and skunk like to bang out names on their drums, their own and other animals. They form a beat and work with syllables on their drums with all the names. Not a huge amount of story but fantastic musicality and rhythm. The book features two main characters, Tanka (elephant) and Shunk. When you read their names together they sound like drums. The ideal book to get little ones shaking their shakers. This is a great book for young pre-K through 3rd grade. The rhythm grabs the litter kids and the older kids see the syllables. It's a very active, get on your feet and stomp book. Hightly recommended. "Skunka Tanka Skunk Tanka Tanka Tanka skunk!" The silliness and rhythm of this book makes it a crowd pleaser. Clapping the syllables is a fantastic pre-literacy exercise that makes learning almost effortless. Great book.